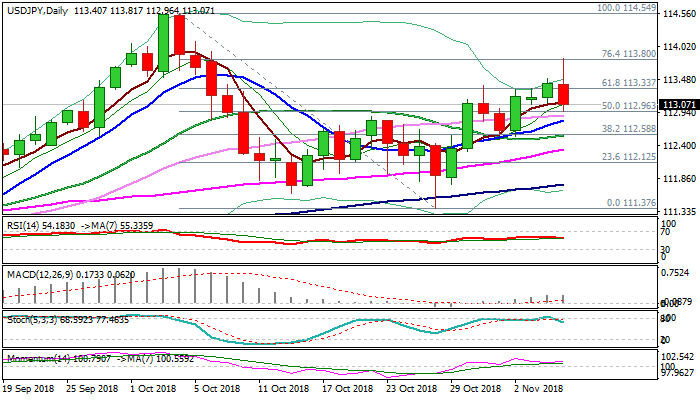 The pair dipped below 113 handle in early Europe, retesting Asian low in overnight’s roller-coaster ride which started after the announcement of US midterm elections. The pair spiked to one-month high at 113.81 on acceleration from session low at 112.96, but reversed quickly on rising concerns about US election results which pressure dollar. Pullback faces strong supports at 112.90 zone (30SMA / daily Kijun-sen / top of rising daily cloud) which is expected to hold and keep bulls intact. Meanwhile, further easing cannot be ruled out as daily slow stochastic reversed from overbought territory, however, momentum is still firm and suggest limited downside. Daily close above 112.90 would be positive signal for fresh attempts higher as overnight’s advance cracked barrier at 113.80 (Fibo 76.4% of 114.54/113.37). The notion is supported by remarks from BoJ official who confirmed that the central bank sticks to its ultra-easy policy, as inflation remains weak despite tight labor market and signs of economic recovery, which could keep yen at the back foot.